- Shatter-proof, sturdy and easily fillable. - Fill them with small trinkets, ribbon, glitter or paper to create personalized gifts, Christmas tree ornaments or decorative pieces. - Not only ideal for decorating the Christmas tree, but also can be used for just about any occasion. - Diameter: 80mm / 3.15inches. Easy to use, each sphere can be separated into two parts in order to open and close them freely. A plastic loop at top, slip a piece of ribbon, rope or wire through the loop to hang. 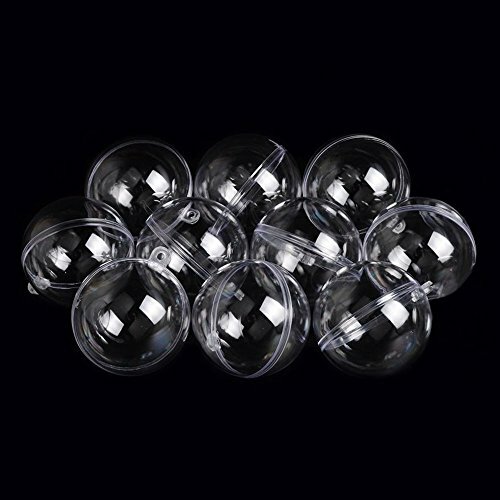 Great for crafts, you can fill the clear balls with any small accents such as beads, mistletoe, trinkets or ribbon pieces to create keepsake items during the holiday season, perfect for christmas, celebrations, party etc. Reusable and shatterproof, made from high quality plastic material, prevent shattering or breaking. Ideal size, round ornament shape, unfinished and ready to decorate. Each package includes 10 plastic ball ornaments that each measure 80mm (3.15inches) in diameter. If you have any questions about this product by UNIQLED, contact us by completing and submitting the form below. If you are looking for a specif part number, please include it with your message. Northlight 60 Count Matte Lavish Blue Shatterproof Christmas Ball Ornaments, 2.5"